Sharing your life with the one you love can bring days of joy and nights of passion. It also can mean fights over who left the laundry to mildew in the washing machine and who discarded that pile of old newspapers that "weren't read yet." This is especially true for couples who are "organizational opposites": One is a mess magnet; the other has tidier tendencies. When you have radically different housekeeping styles, it's difficult to maintain both a reasonably well-ordered home and a loving relationship. Take it from me. I never set out to marry the most disorganized man in the world. It was just coincidence – or karma – that we happened to meet right after I had decided to become a professional organizer. That was more than 17 years ago, and we've been happily married for 13. Early on in our relationship I realized it was unrealistic to expect Henry to change his extremely "casual" organizational style, and I accepted that he probably never would. Learning to accept instead of expect is not an easy process, and there are times I still struggle with it. Yet this process has proved to be a crucial building block of our marriage. It also turns out to be the first rule that marriage counselors and therapists recommend. "All too often, couples go into the relationship expecting to change the other person, crossing their fingers and hoping their partner will become neater and better organized or not so uptight," explains Elayne Savage, a relationship and communications expert and author of "Breathing Room: Creating Space to Be a Couple" (New Harbinger). "These unrealistic expectations are a form of magical thinking which often leads to disappointment." Savage says that it's important to respect your partner's different style of doing things. "Neither style is right or wrong, it just is," she asserts. "If you can practice some tolerance for differences, some flexibility and compromise, you can be more accepting." This is a very good thing to keep in mind when you feel like screaming after finding, for the thousandth time, your spouse's dirty clothes discarded on the floor – right next to the laundry hamper. What often helps is to think about all the things you love about your mate, which, it is hoped, are more plentiful than his or her less-lovable habits. I tend to remind myself that the traits I love about my husband are part of what make him messy. Henry is very easygoing and good-natured, and messiness – his own or anyone else's – doesn't really bother him. I like to say he loses everything except his temper and his patience, but since those are the only things I lose, it balances out. So early on in our marriage, I decided to accept (again, that important word) that having a well-organized, neat, clean home was important to me, but not to him. What this means is, since he doesn't really care how tidy the inside of the house looks, it makes no sense to expect him to feel otherwise. Therefore, why waste time and energy nagging, arguing, threatening or begging? I'd rather pick up after him than harass him (although I admit that on occasion I do both). Neither of us, however, wanted me to end up feeling resentful for being a one-woman clean-up squad. So we had to figure out how to share the load in a realistic way. "There is a line of respect concerning order in the house which the messy person needs to understand is very important to the neater one," says Sandra Felton, author of "When You Live With a Messie" (Revell). "It is seldom that both will have exactly the same standards or issues." That's why it's crucial for couples to discuss their expectations. "Communication early on is super important," notes Felton, who also happens to be the founder of Messies Anonymous (www.messies.com). "It may be good to do it in writing so it's clear." Communicating our needs and putting them in writing certainly worked for us. Here's how we did it. Then there are the tasks neither of us prefers – cooking, doing dishes, running errands. We agreed to share or alternate these. Couples who aren't able to divide the chores equitably might consider hiring a housekeeper. Don't automatically assume that this is beyond your means. In "A Housekeeper Is Cheaper Than a Divorce: Why You CAN Afford to Hire Help and How to Get It," author Kathy Fitzgerald Sherman shows that hiring help can be not only an effective time-management tool but also the best economic decision for a family. The book offers ideas for rearranging budgets to make a housekeeper an affordable option. Even without a housekeeper, our system works well overall. But with Henry's uncanny ability continually to turn tidiness into mess, and my unquenchable desire to transform chaos into order, a good system was only part of the solution. The challenge of allocating space – his, mine and ours – still needed to be addressed. "In relationships, both clutter and orderliness can easily become a battle for space," says Savage (www.elaynesavage.com). "It's nice to have a space of your own to keep it whatever way makes you happy – and close the door so it's for your eyes only." Which brings us to The Pit. When I married Henry, the first thing I did was excavate his house. It was stuffed with everything from old newspapers to decrepit furniture to a variety of mysterious, unidentifiable objects. I got it all cleared out and organized – except for one small room that was particularly horrendous. Since I noticed that Henry seemed rather fond of it, I asked whether he'd like me to help him organize the room or just let it be. Much to my chagrin, he told me, "This is the only room that still feels like me, so it's OK if you leave it alone." Thus was born The Pit, our fond nickname for the place that became an important component of our household management program. 2. Nothing Henry might leave around the house would get tossed without his permission, but within 24 hours I could transfer it to The Pit. (Usually to the floor just inside the door – the only clear surface). Establishing rules together for your household – and respecting those rules – is a way to show respect for each other. Respect is important in any relationship, but it can get buried under the rubble of neglected obligations and broken promises. This is all too often the case when organizational opposites share a home. 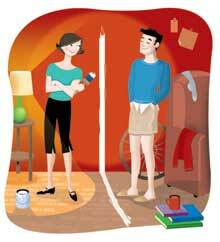 It's common for the neater half of the couple to get so frustrated that she or he starts discarding the messy one's "clutter." Unfortunately, this also demonstrates a lack of respect not only for your mate's property but for his or her feelings. As Savage points out, "Do you really need to clutter the relationship even more with hurt, anger and resentments?" Better to have a discussion (not an argument) and work toward a compromise. Again, having a space of one's own can make this process easier. If it's not possible for each person to have a separate room, try to allocate a small area. Sometimes a closet can work, or a corner of a room if you use a decorative folding screen as a room divider. Then again, if your better half has pack rat syndrome, aka hoarding (a clinical condition related to obsessive-compulsive disorder), not even a separate house will be enough. I feel lucky that Henry, despite his disorganized ways, is able to periodically discard, donate or even sell some of his clutter when it reaches "critical mess" (the stage after critical mass). For those who never seem able to let go of anything, behavior modification therapy is probably the best recourse. The National Study Group on Chronic Disorganization provides information and resources on the topic of hoarding and what to do about it through its Web site (www.NSGCD.org). Fortunately, the condition is fairly rare. It's estimated that less than one-half of 1 percent of Americans suffer from this disorder. One problem that often goes hand-in-hand with the clutter issue is the loss of time spent looking for misplaced things, when your spouse wastes many minutes every day on frantic "treasure hunts." It's hard not to get angry searching for keys, wallet, glasses or other frequently lost items. That's especially true if you find yourself leading the search party for, say, tickets to the special event you were looking forward to attending but now will arrive late. My dear disorganized husband had the annoying and time-wasting habit of misplacing his keys, glasses and various other things at least once a day. Fortunately I finally was able to get him to follow one of my best pieces of advice: Never, even for a second, put a larger object (such as a newspaper, open magazine, or jacket) on top of a smaller object (such as keys, glasses or wallet). Follow this rule and you too will spend less time annoying and more time enjoying each other. Work to accept the way your mate is and let go of unrealistic expectations. Communicate to establish mutually agreeable standards and divisions of labor. Give each other space and respect each other's choices. Harriet Schechter has helped thousands of people get organized since 1986, when she founded The Miracle Worker Organizing Service in San Diego. Now a Santa Barbara resident, she also is the author of three books, including "Let Go of Clutter" (McGraw-Hill). Her online advice column is at www.MiracleOrganizing.com. Copyright 2004 Union-Tribune Publishing Co.